With summer already gone, ski season will soon be upon us. It’s a great activity for kids and adults alike. It is fun, it keeps you active and you get to spend time away from the noise and gloom of the city life. Being safe is the main priority when skiing and jackets are one component of that. Not just any jacket, mind you, as skiing is an activity best enjoyed with the appropriate jacket. 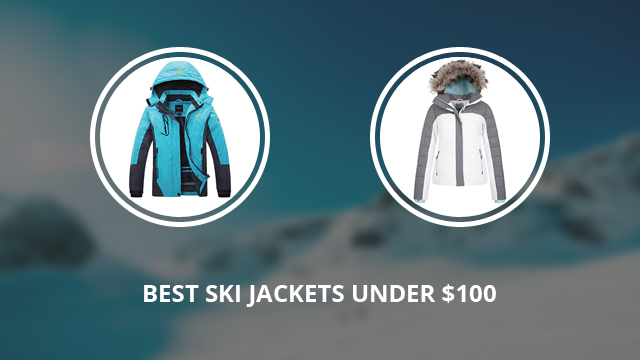 Ski jackets are designed specifically for skiing and snowboarding, and for good reason. Being warm is not the only thing that a jacket must provide when you are out there on the snow. 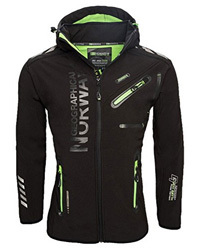 You need to be able to move freely and unrestricted from what you are wearing and a ski jacket provides exactly that. While there are plenty of options available, and we, too, have looked at some of those options in the past, today we thought to compile a selection of 7 ski jackets under $100. Being safe and having fun does not mean you have to spend a fortune, so let’s take a look at these affordable jackets we have picked out for you. * Note: The availability of the products in this page (including colors and sizes) might change at any time. Also please check the products materials and features on the various shops before buying. We do our best to assure the accuracy of our articles, but sometimes they might contain errors. The product images shown are for illustration purposes only. The price (under $X) refers to Amazon.com or Amazon.co.uk. 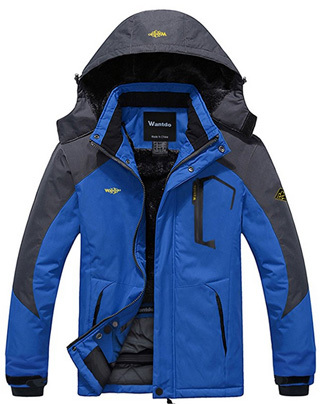 The first design is by Wantdo, the Mountain jacket for man. It is made of Polyester, with waterproof coated fabric on the outside which repels water and prevents it from pooling on the surface of the jacket. It has a waterproof rating of 10.000mm and it is also windproof. It comes with an adjustable, removable hood and a high stand-up collar. There are three outer pockets on the outside and two on the inside, one of which is a media pocket with an earphone duct. The sleeve cuffs are adjustable on the outside and also come with elastic wrist gaiters to protect the hands. The cut is straight and it fits a little big, which leaves room for layering underneath. There is a snap powder skirt inside and the inner lining is made of soft Polyester fleece for added insulation. 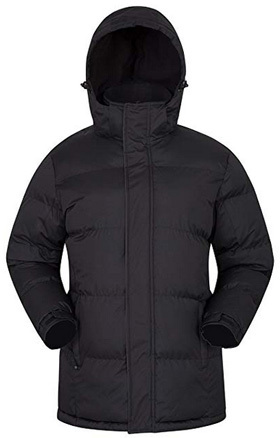 The jacket is also lightly padded with Cotton insulation. There are many options to choose from: Red, Sky blue, Black, Coffee, Grass green, Khaki. Next, it’s Snow, a padded jacket for men by Mountain Warehouse. This design is warm and water-resistant, with water-repelling coating applied to the shell. The padding is microfiber, which helps insulate and adds to the comfort factor of the jacket. It comes with a stowaway hood, but there are options where it can be detachable by a zipper. The hood is adjustable by drawstrings, as is the bottom hem. The sleeve cuffs are also adjustable by Velcro fasteners and the main zipper is protected by a storm flap. This is a Polyester jacket, quilted and which comes with multiple pockets on the outside and inside. There are two colors available: Black and Navy. By 4HOW we have picket Mountain, a waterproof jacket lined with fleece on the inside. This fleece lining is thick and fuzzy, helping with insulation and comfort. The shell is water-resistant and there is a high collar with front flaps for better protection. The hood is adjustable and removable, also lined for added warmth. There are two side pockets that serve as hand-warmer pockets, one on the chest and two on the inside of the jacket. It comes with adjustable cuffs and a covered main zipper, which is protected by a snap placket. 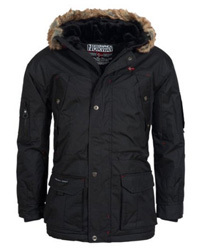 It is a thick and comfortable jacket, which provides plenty of warmth in low temperatures. This design comes in the color Black. 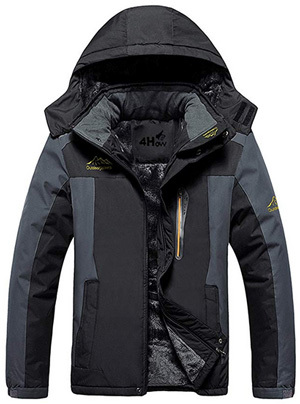 The fourth and last jacket for men is by Outdoor Master, a 3-in-1 ski jacket. 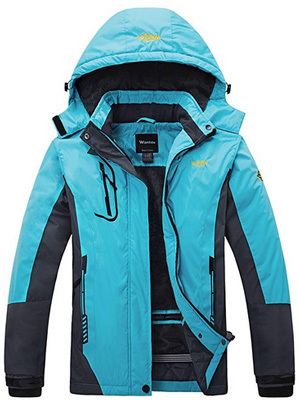 It is a 100% Polyester jacket, which comes with a waterproof outer shell. The shell has a high collar and adjustable cuffs and hem. There is a removable hood, which is helmet compatible. Its main zipper is covered by a storm placket and there are two easily accessible chest pockets on the outside. The under layer is a fleece jacket, which is lined with fuzzy fleece on the inside for added warmth. It is a breathable and very warm inner jacket, with two side pockets and elasticized sleeve cuffs. 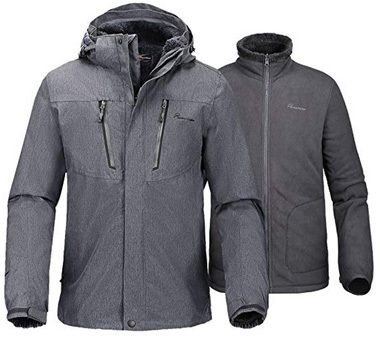 This 3-in-1 jacket comes in the color Graphite. 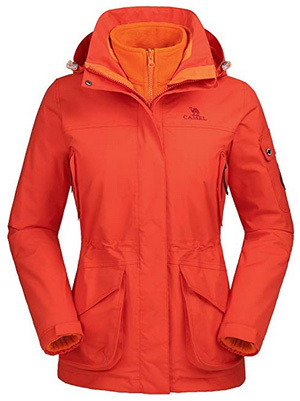 Moving on to the women’s jackets, the first one is by Wantdo, the women’s version of Mountain. Just like the men’s design, it is made of Polyester and it lined with fleece on the inside for added warmth. The hood is adjustable and detaches from the collar with a zipper. The sleeve cuffs are Velcro-adjusted and the main zipper is covered by a storm flap. There are two side pockets on the outside and one on the right side of the chest. On the inside you will find two pockets, one of which is media-compatible. It has a waterproof rating of 10.000mm, making it suitable for both snow and rainfall. There are many colors to choose from: Black, Blue, Purple, Rose red, Red, Yellow. By Mountain Warehouse we chose Monte Rosa, a warm and snowproof jacket, with DWR coating that repels water. 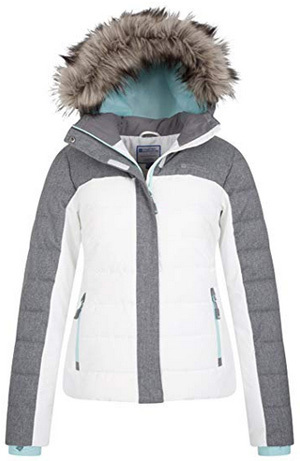 It is a breathable jacket, which comes in the color White, and has a detachable snowskirt for extra protection when you are out skiing or snowboarding. The collar is high and the hood is adjustable with drawstrings. To protect the face there is faux fur trim on the hood. The cuffs are standard, but to keep the hands protected and prevent wind from getting inside the jacket there are wrist gaiters available. Multiple pockets are placed on the outside and inside of the jacket for safe storage. We will be ending today’s selection with a 3-in-1 jacket for women by Camel. 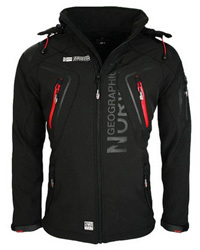 This is a waterproof jacket, with a windproof shell that comes with an adjustable hood and a high collar. The shell is made of Teflon, which serves as a windbreaker, while also providing 5.000mm water pressure resistance. The design is ergonomic and suitable for extensive mobility, with two side pockets for the hands, one on the left sleeve, two on the chest and inner pockets as well. It adjusts at the waist and cuffs, too. 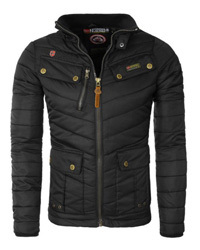 The inner jacket is made of 100% Polyester fleece, which is breathable and insulating. There are two side pockets on the fleece jacket and its cuffs are elasticized for better protection and a more comfortable fit. Previous Article← H2No vs Gore-Tex Technology: Which One Is Better?